Weight: 160 lbs. With armor 300 lbs. Powers: None. However, OverLord’s armor makes him invulnerable to harm, providing him with a powerful force-field which can deflect most any attack. The actual armor is made up of dense metal that is almost impossible to breach and can withstand Dragon’s punches with no problem, giving an indication of its durability. The armor also projects intense energy beams and allows its user to fly for an unknown length of time. Following the death of Antonio Seghetti, the OverLord armor was locked up in Stronghold Penitentiary. It was briefly worn by both Mace and CyberFace before getting thrown away by BrainiApe. The device was left lying around in Pipetown where the Vicious Circle battled against Dragon, the Chicago Police Department and various heroes. It was picked up during the melee by Vic Nixon who spotted it as a means for him to spy on the object of his affection, Rita Medermade. Nixon began wearing the armor more and more and soon started noticing that he could not remember the events that had occurred whilst he wore it. This was due to Seghetti’s downloaded mind gaining an increasing amount of control over both the armor and Nixon himself. After OverLord started killing again, he refused to allow Nixon his freedom for fear of discovery and kept him trapped inside. OverLord set about reclaiming the leadership of the Vicious Circle but when he seemingly killed Jennifer Murphy at her wedding to Dragon, things began to fall apart. 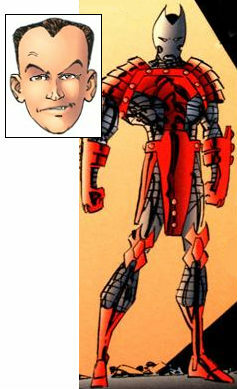 Dragon dedicated himself to locating and eliminating his arch-enemy and found an ally in the form of PowerHouse, one of those villains looking to rule the Vicious Circle himself. Dragon renewed his search for OverLord with new intelligence but was taken prisoner by his foe’s followers. He broke out of a death trap and defeated these villains before ultimately confronting OverLord himself. Dragon pummelled his enemy until the helmet popped open to reveal Nixon’s face, having died from a heart attack brought on by the shock of this assault. The OverLord armor was then taken away and destroyed by the authorities before any other innocent lives could be lost.